A collaboration between An Post and Ordnance Survey Ireland (OSi), GeoDirectory is Ireland’s leader in postal and geographic addressing. The GeoFindIT app allows you to access the GeoDirectory database of 1.9 million buildings and 2.2 million Irish addresses. GeoFindIT also has over 195,000 business addresses and is the most extensive business and residential property listing in Ireland. The database is updated on an ongoing basis with quarterly releases of new data which are also made available in the GeoFindIT App. The first edition of the GeoFindIT app proved popular with the average number of monthly users growing by over 500% between March 2014 and June 2015. The challenge for the new version of the app was to streamline the search function and to add a new AR (Augmented Reality) feature to display property price information. Púca developed a new augmented reality setting so that users can open the app anytime, anywhere to see real-time overlays of house prices, directions and more. Users can check out local property prices by strolling down their street with GeoFindIT open on their phone. When the augmented reality setting is open, the app works intuitively, displaying price and direction information for properties in whichever direction the user’s phone is pointing. In addition to the augmented reality feature, Púca completely redesigned the app and included an integrated search function which works without a radius so users can search for locations anywhere in Ireland. Users can either type in their search or pinpoint their starting position using their current location or by dragging and dropping the Little Helper icon to their desired start point. The app was designed specifically for iOS and Android smartphones and will also function on iPad and Android Tablets. 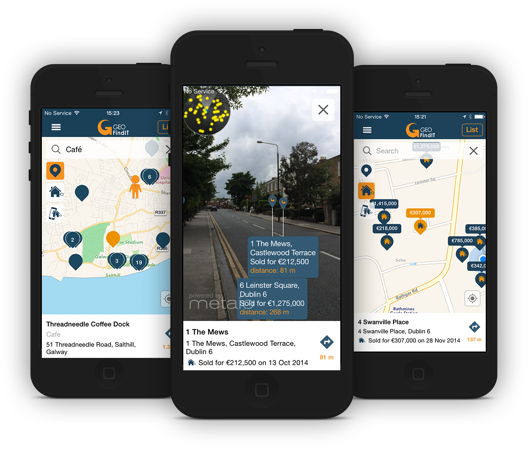 Using Púca’s app development know-how GeoDirectory have successfully leveraged their location assets and made them available to a wider audience. In addition searching for private and business addresses users can now also find out the price of properties sold in Ireland with data drawn from the Property Price Register to ensure all property prices displayed in the app are as accurate as possible. The augmented reality feature adds a whole new dimension to the app, and further augmented reality content is envisioned for future releases. Speaking about the revised app, Dara Keogh, GeoDirectory CEO said “We’re really excited to be able to bring such an innovative app to the market. We’ve completely changed the app since the last version. We’ve added some fantastic features to the new edition, in particular the augmented reality function. It’s something we couldn’t have done a few years ago but which really adds to the user-friendliness of the app and sets GeoFindIT apart”. Check out the GeoFindIT augmented reality app video case study on YouTube.